An incredible collection of bones of some of the most amazing prehistoric creatures! 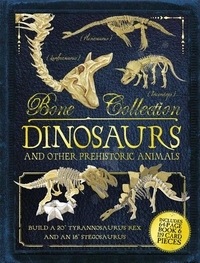 Bone Collection: Dinosaurs and Other Prehistoric Creatures takes readers back millions of years to the prehistoric land where dinosaurs walked, pterosaurs flew, and plesiosaurs and ichyosaurs swam. This book examines the skeletons of prehistoric creatures and how paleontologists have reconstructed their bodies through the discovery of fossils. From the mighty Gigantosaurus to the plant-eating Triceratops, children can examine these prehistoric creatures and discover how they looked and lived millions of years ago. After reading the 64-page book, children get to build their very own T.rex and Stegosaurus models!